Railroad Park has earned positive national attention for Birmingham from influential publications and organizations that praise everything from the Park's design to its success in stimulating revitalization and transformation in the city. As importantly, we earn positive attention from local five year olds. One of them told us, "I like the big orange fish in your pond. I named him Sophia, just like my sister." Every day we hear from many voices about how our 19-acre green space makes Birmingham an even better place to be. Railroad Park Foundation's goal is to make the Park a place for Birmingham to brag about for generations to come. Railroad Park relies on public and private donations to operate. It takes support from many people, many sources to maintain the Park. If you've been prouder of Birmingham since the Park opened or if you've had more fun in Birmingham since the Park opened, please consider making a donation. And thank you for bragging on us. We are working to earn that. 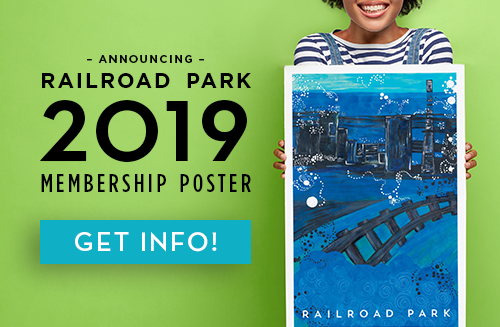 You can support Railroad Park through a one-time donation, or to maximize the impact of your gift, you can become a Railroad Park Member.